So you started up a side business to supplement your performance career (oh, you haven’t done that yet? Well, then you really need to see THIS. 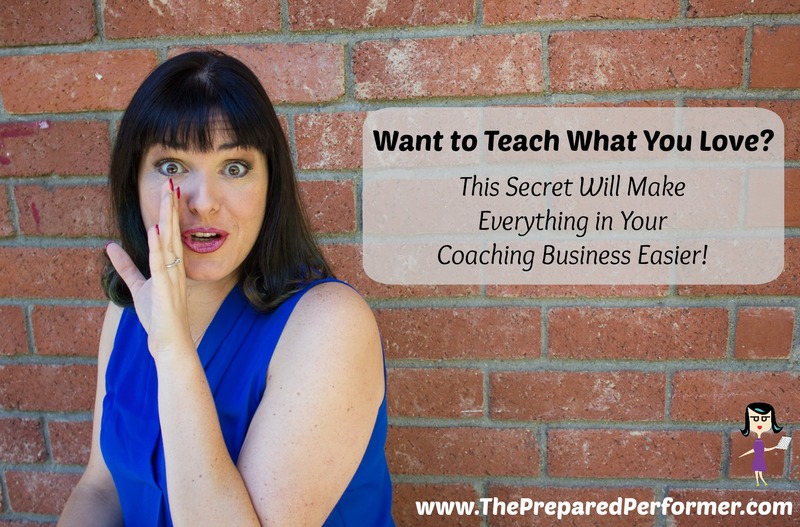 Or maybe you’re still putting all the pieces together, but you’re well on your way to earning side income from your own performance coaching business. Either way, if you’re on track to create your own income stream to supplement your work as a performer, there’s a little secret that you need to know. It’s something that can make or break your side business. Something that can make the difference between you burning out after a couple years, and you loving your work with all your heart. Here it is: no matter what you do, you must be yourself. You must infuse your uniquely brilliant and inspiring personality into your work or it won’t work! Performers know this all too well: you are your product. Whether you’re a vocalist, an instrumentalist, an actor, or a dancer, you’re selling not only the technique of your art but also your interpretation of your art. They see results because of my ability to coach them, but they connect with my personality! Whatever your side business may be (and if you still need help figuring out what exactly your business is, click HERE for a free 20 min Breakthrough Session), whether it’s teaching diction or audition prep or offering recorder lessons, your personality will play a major part in your ability to attract and retain clients/students. And it’s a heck of a lot easier to infuse your actual personality into your work than some made-up persona that you think they’ll want to see. Okay, so let’s get specific for a minute. Where will your personality shine through in your business? Your weekly newsletters + blog posts. Have you ever seen a boring newsletter? Probably not all that often, because you unsubscribe as soon as you get it! On the other hand, you’re way more likely to actually read an interesting, quirky newsletter that has some personality. Your social media presence. Every little thing you tweet, re-tweet, post and “like” is an expression of your personality. Have fun! Let loose! Your audience will love you for it. Your work style. Look, if you’re a piano teacher but you can’t stand to hear chopsticks one more time (how many students do you think I’ve had ask to sing Defying Gravity STILL YEAR AFTER YEAR!? ), maybe create something new. Let your passion for the art define how you teach the technique and don’t be afraid to be completely original. Bottom line: there are many, many ways for performers to make money on the side in this day and age. You aren’t the exception! With a little persistence and passion mixed in with the original flavor of “you,” your journey to bring in money on the side can be rewarding and fun. Need some help? Click HERE to set up a time to speak with me directly and find out just how to do that. We are launching a 7 day Free Challenge for Performers who want to build a business doing what they love. Go to www.StarvingArtistSyndrome.com for more info!